Our children’s Biblical education takes priority over any other subject we teach. Do not get me wrong. Reading, math, science, etc. are all very important, but we teach these with the understanding that without faith nothing in this life is worth anything. First and foremost we desire our children to be strong in their faith. We are training disciples in our home that by the grace of God will grow to be followers of Jesus and to spread His Word. We will teach our children all subjects, but with the goal in mind of preparing our children to be thoughtful concerning all things; discerning by the standard of God’s Word. Our children do not enter this world as a blank slate; they are born sinful, and we must diligently train them both to restrain the effects of that sin nature, and to lead them to do what is pleasing to God (Romans 3:23). We do not need any help sinning. Think of the terrible two’s. As parents, we are commanded to teach “diligently” God’s Word to our children as we sit in our house, when we walk by the way, and when we both lie down and rise up (Deuteronomy 6:7). We are commanded to talk about God all the time in our family and have Him be a part of everyday conversation and living. This only reinforces the first and greatest commandment, “love the Lord your God with all your heart mind and strength” (Deuteronomy 6:5). Regardless of how you feel led to educate our children, it is the responsibility of every Christian parent to teach their children to fear the Lord, in hopes that they will one day be brought to faith. Our goal is to raise up the children God gives us into mature disciples of Christ. How do we manage to do this within our families? Bearing the responsibility for the spiritual lives of our children is an overwhelming task that cannot be taken lightly, or accomplished in our own strength. Without the power of the Holy Spirit living within us, any effort we undertake to train our children’s hearts in the love of the Lord, and teach their minds the Word of God, will fail miserably. This is not a task that we can subcontract to the local church. This is not the role of a Christian school to form our children’s Biblical perspective and worldview. God gave parents the responsibility to train their children up in the Lord, so that when they are old they will not depart from it (Proverbs 22:6). We cannot hire out our God-given responsibility to train up the children we have been given. First and foremost, we must be parents that are in the Word and in prayer. You cannot teach your children to be something that you are not. Children learn by example. It is very important that you as a parent have a right understanding of doctrine and theology before teaching your child. There are many helpful Bible studies and tools both online and possibly in your local Christian bookstore to help you grow in your faith and to challenge you in your knowledge. I would challenge you to start with a catechism as this gives the basic doctrinal information that every Christian should understand as the groundwork for their faith. Remember that just because something has a Christian label pasted to it, does not make it a Christian book. Our standard should always be the Word of God, if we read a book that does not interpret scripture properly or in context then it may not be worth reading or at least worth allowing it to shape our Biblical perspective. Just as we ought to teach our children to have discernment, we must have discernment. As a family, we conduct what we call family worship. We have a time before we put our children to bed, that we join together in the living room and we play instruments, sing hymns, pray together, and read God’s Word. This is also a teaching time where we practice our Scripture memory and catechism questions (READ HERE to learn more). This is a very treasured time within our family that we enjoy and look forward to every evening. I highly recommend instituting some sort of structured family devotional time in your home. Structure and schedule do help us to stay on task and it keeps us accountable. The key to discipling your children is to depend on the Holy Spirit and to be intentional in your parenting. Parents, if you are not seeking the Lord personally then you are wrong. If you are leaving Biblical teaching up to the church, then you are wrong. If you are not being intentional day in and day out to find those teachable moments to share the Gospel with your child then you are wrong. And you know what, we are all making these mistakes. I am not always good at this. I get into the swing of my own schedule and life and I forget to be intentional, and we will go weeks at a time sometimes with out doing our family worship. I figure we always have another day to get it right … but we might not. Our children belong to the Lord, and as parents we ought to be seeking to glorify God in how we take care of these blessings He has bestowed on us for this short time. They could be taken from us the next day or they could grow up to be a missionary to spread the Gospel far and wide. What is the saying? “The Hand that Rocks the Cradle Rules the World” … We don’t rule the world as parents but we are definitely the most influential players in the lives of our children. We can choose to do this flippantly by the seat of our pants or with great care and calculation according to God’s Word and Will. I completely agree with this. I like how you do family worship. We have tried each Sunday and then spontaneously throughout the week, but I like the simple gathering and singing and praying just before bed. That would be a great time to review our memory work with Daddy too! I think you have great intentions, but I would just like to mention one thing. I was raised in a house similar to what yours sounds like, went to Catholic school, was involved in youth groups, etc. It was a very loving atmosphere most of the time, but somewhere along the line “we are all born sinners” was emphasized too much. Growing up, I was afraid to make mistakes because “God would know” and I felt powerless to change what an awful person I was. I tried very hard to be the best sister and daughter I could be, but I inevitably made mistakes. These mistakes crushed me. I became obsessed with being perfect, and that manifested itself into OCD and a mild eating disorder. I now believe that I developed these disorders because it was something I could control, whereas I felt I could not control how much of a “sinner” I was. I am not saying that you personally are giving your children this message, but I do not think it is healthy to tell our children that they are born horrible sinners who, if not given the “guidance” of religion, would be awful, destructive people and not make it into heaven. Even now as an adult, when I make a mistake, I get very down on myself. People tell me to “lighten up” and that what I did wasn’t a big deal, but I can’t shake that message that was ingrained in me from childhood. I would just caution everyone to be careful how much they emphasize the sinner aspect of religion, and instead emphasize how we want to be the best people we can be to help and serve others and please the Lord. Lindsey, I love this! Disciplining my son is the main reason for us homeschooling. 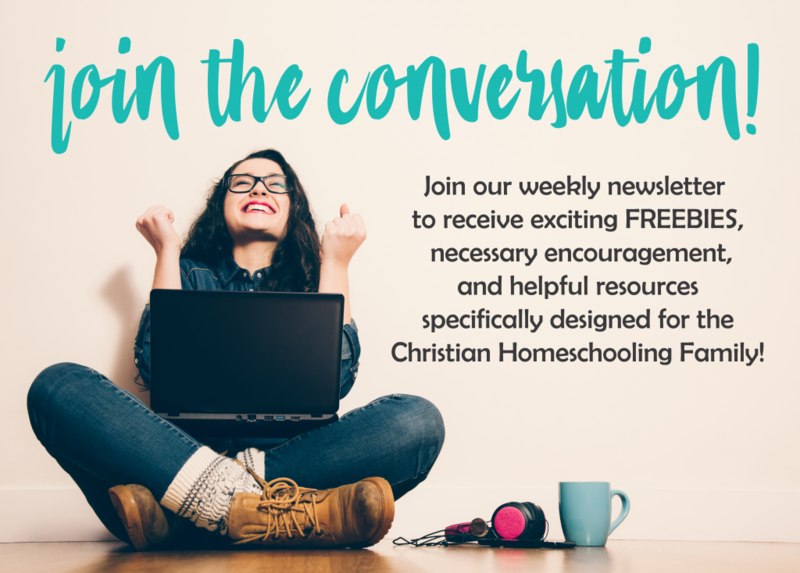 I’m sharing in a homeschooling roundup today. OH Thank you! That means so much to me Lori. How sweet of you to say that and to be sharing it. Thank you!